1 of 5 Layer the carrots, parsnips, onion, apricots, prunes and garlic in a 5- to 5 1/2-quart slow-cooker. Place the cinnamon stick, cloves and allspice on a piece of clean cheesecloth. Tie the ends together with kitchen twine to form a little bundle. Place the pork ribs and spice packet on top of the vegetables. 2 of 5 Stir together the 1 cup chicken broth, the orange juice, balsamic vinegar, salt and pepper in a 2-cup measure until well blended; pour evenly over the ribs. 3 of 5 Cover the slow-cooker pot; cook on high for 5 to 6 hours, or on low for 10 to 11 hours, until the vegetables and pork ribs are tender. 4 of 5 Remove the ribs to a large platter; cover with aluminum foil to keep warm. Remove the spice packet. 5 of 5 Stir together the remaining 1/2 cup chicken broth and the flour in a 1-cup measure until well blended and smooth. Stir into the liquid in the slow-cooker. Cover the pot and cook on high for 5 to 10 minutes or until the liquid is thickened. Spoon the vegetable mixture from the pot around ribs on the platter. Serve with rice or couscous on the side for soaking up the juices, if desired. Makes 4 servings. 1 of 1 Cook pork ribs in large, heavy pot until browned all over, about 10 minutes. Remove ribs to a plate. Add carrots, parsnips, onion and garlic to large skillet. Add 2 tablespoons water; cook until vegetables are just barely softened, 3 to 4 minutes. 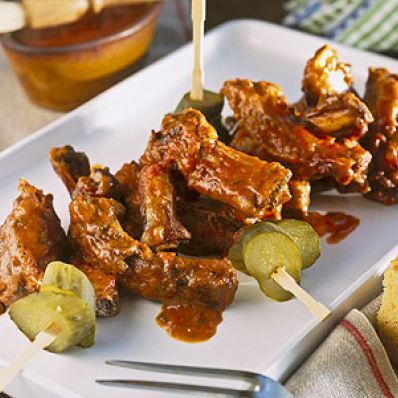 Place ribs on top of vegetables. Add apricots and prunes, gently stirring to mix in. Add 1 cup of chicken broth, the orange juice, vinegar, spice packet and salt and pepper. Cover pot; simmer over medium-low heat until pork ribs and vegetables are tender, about 1-1/2 hours. Remove ribs to large platter; cover with aluminum foil to keep warm. Stir together the remaining 1/2 cup of the chicken broth and the flour in a small cup until well blended and smooth. Stir into vegetable mixture in the pot; cook, covered, until the liquid is thickened and bubbly, about 4 minutes. Spoon over the ribs on the platter.